Home / Downloadable / NinjaStik Now Sale! Online anonymity with encrypted storage. Make as many as you want. Get your privacy back. Today. A complete desktop operating system – fully encrypted, self contained, portable, will run on any computer that can boot from a usb drive. Browse anything you want without your ISP logging everything and every site you visit. Anything you do on the NinjaStik is encrypted, unplug the NinjaStik and leave no trace on the computer. 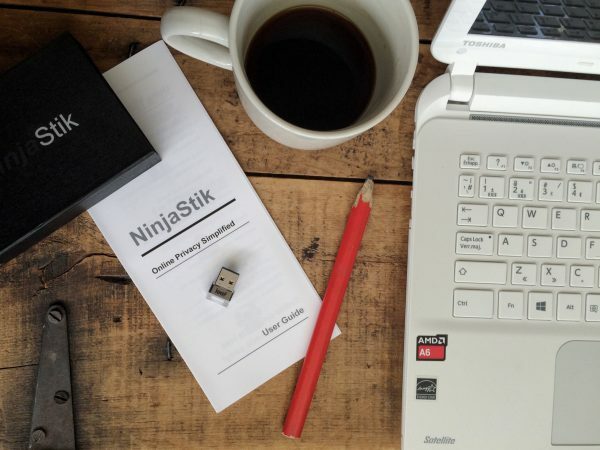 Make a NinjaStik for family, friends, employees, team members, etc. Privacy makes a great gift and they don’t need to know you get unlimited copies! Imagine having a laptop running on a fast, secure, fully encrypted operating system. Online privacy with Tor browsing, encrypted email and any cryptocurrency wallet you want. Guaranteed to work on your computer or your money back. If, for any reason, you are unhappy with your NinjaStik, let us know within 20 days and we’ll refund your purchase, 100%. No questions asked, no red tape, no difficult process, no long line-ups, etc. All transactions are handled through Paypal for security but also ease of returns and your peace of mind. It’s Fast, Easy to Use, Very Secure, and it’s got a Guarantee! What are you stalling for? You know you want this. Because they don’t need to know. Browse Anything You Want, Anonymously… in Seconds.